When a young country boy’s thoughts turn to suicide, what misadventures and capers ensue as he embarks on a sea cruise? Come find out! We’ll meet our narrator Ishmael, Queequeg the Prince of the South Pacific, Starbuck the hip barista from the west coast, the jolly and sanguine Stubb, as well as the whimsically malicious, sinfully delicious Ahab, heretic Captain of the Pequod, the crew’s destiny, and perhaps yours too. Journey with us as they travel the world and vie for Ahab’s prized gold doubloon, and then doubt that it’s worthwhile, and question their Captain, life, the universe and everything, and then… well… lots of other stuff. And, oh yeah, there’s a whale! 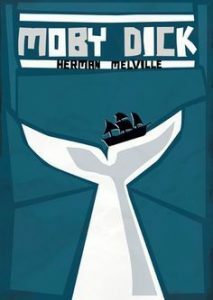 Herman Melville’s wry wordage and his extraordinary, bone-dry sense of humor will pop when read aloud. This is the 200th anniversary of Melville’s birth. Now is the perfect time to pick up this humane, national tale.